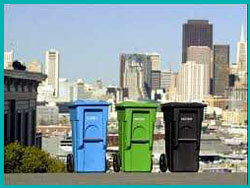 Landfill Global Warming Issue, How Landfills causes Global Warming? Landfills’ gas collection systems are inherently dysfunctional, only working during the limited time when the site is sealed but, when little gas is generated. But, diverting our food scraps and yard trimmings from landfills will prevent methane generation from our discards at the source. More than 100 cities are doing this and you can help by encouraging your city to join the growing movement. Landfills emit lots of methane which, like carbon dioxide, is a greenhouse gas (GHG) whose rising emissions threaten to overheat the planet. But, although there is much less of it, methane has more than 33× the warming power of CO2. For runners who have done a 4-minute mile, had they a methane wind at their back, they could do that mile in 7 seconds. Moreover, as a short-lived gas, methane’s warming potential is concentrated in the next 20 years when it is 105× CO2’s, which is also when we risk crossing irreversible tipping points like the loss of summer Arctic sea ice. Methane is truly a greenhouse gas on steroids, and that is the case even if one uses a long outdated measure of methane’s global warming potential, which is still listed in many reports, of only 21 times CO2. The takeaway message is this– any major source of the methane that leaks even a little bit is very bad for global warming. 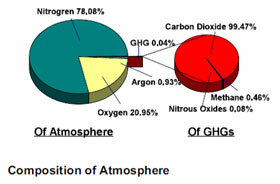 The carbon dioxide and other greenhouse gases in the air we breath occupy less than 0.04% of the thin atmosphere that covers the earth (see the PIE CHART below). Notwithstanding their lack of abundance, they play a critical role in regulating the temperature of our planet. 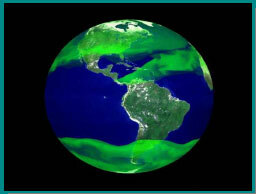 In tandem with a parallel set of feedbacks from water vapor, ozone at ground level and complex interactions from aerosols like soot and sulfates, these greenhouse gases effectively absorb the sun’s energy that falls on the earth as it is radiated back, which otherwise would have escaped to outer space. Like hot houses, in which the glass roof traps in heat, these gases blanket the earth in warmth creating a global greenhouse effect (see GRAPHIC along side). Absent the greenhouse effect from water vapor during the current Holocene epoch, which is the goldilocks period since the last ice age when human civilization developed agriculture and flourished, our planet’s average temperature would have been significantly colder. Estimates are that typical temperatures on earth without that greenhouse effect would be about zero degrees Fahrenheit instead of the current average of 57EF. However, on the flip side of the coin, if carbon emissions from human activity doubles the level of greenhouse gases that existed before industrialization, we are expected to drive up temperatures and destabilize weather and moisture patterns that modern societies have come to depend upon. The last time the level of carbon dioxide did rise to and was sustained as high as today’s 390 parts per million (ppm), which is just 40% higher, was more than 15 million years ago. Global temperatures, then, were 5E to 10E F higher than they are today, the sea level was approximately 75 to 120 feet higher, there was no permanent sea ice cap in the Arctic and very little ice on Antarctica and Greenland. Many scientists are of the view that upsetting our climate applecart this drastically again through our own actions would likely have similar catastrophic consequences for our grandchildren. Most of the discussion you may have heard about climate change has focused on carbon dioxide (CO2) from burning fossil fuels. 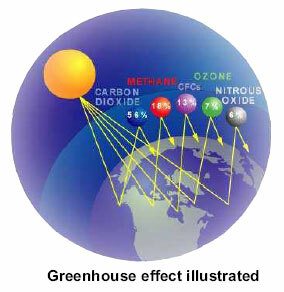 However, there are actually three other types of greenhouses gases that also threaten to overheat our planet. Those are methane, which is one of the major gases that escape from landfills, as well as nitrous oxides largely from fertilizers and fluorocarbons used as propellents and coolants. Attention has previously focused on carbon dioxide because there is so much more CO2 relative to those others. Indeed carbon dioxide is 99.5% of all of the greenhouse gases, if you just counted the number of their molecules in the atmosphere. 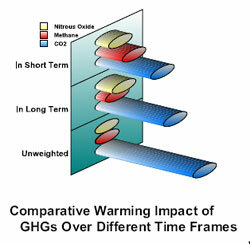 But, not all greenhouse gases (GHG) are created equal in the sense of how effective they are at warming the earth. Methane is far more potent than CO2 – 21 times more powerful from its direct impacts alone. And recently, scientists have documented that methane is 33 times more effective, as, over the years we have quantified several of its indirect effects on other causes of climate change, as shown in the accompanying CHART. 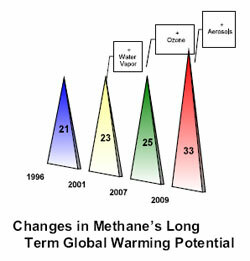 Moreover, thirty-three times is when methane’s impact is envisioned over the long term of perhaps 100 years. 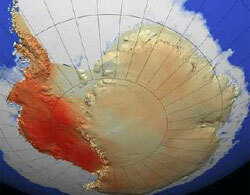 In fact, though, methane is actually a very short-lived gas that decays in about 10-15 years. For that reason, all of methane’s warming potential is focused in that first decade or two when it is amplified to 105 times CO2’s. Critically, climate scientists warn, those next 10 years also encompass the same time frame that we confront irreversible tipping points if something is not done quickly like methane reductions can generate. Look at the chart along side and you can see how methane’s importance (shown in the red bar compared to CO2’s blue bar) grows dramatically as one weights it by its long and then its short term warming multiplier in relation to carbon dioxide’s. For this reason, increasingly climate experts are calling for an urgent campaign to immediately reduce methane releases so we can achieve a quick and significant reduction in the warming impacts acting on our climate, buying time for the long term measures to take hold. All of which means that any major source of methane that leaks even a little bit is a very bad thing if we are to avert the dire consequences of global warming. 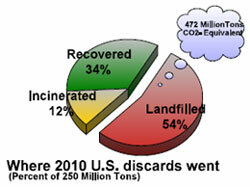 Landfills generate lots of methane, and most of that escapes into the atmosphere. If you’re like most people, when asked what are the causes of climate change, you probably think of power plants and cars, not dumps. But, because landfills emit methane, lots of that greenhouse gas on steroids, they warrant a closer look to find out how much is made and released. It turns out that landfills generate major volumes of methane, most of which escapes. 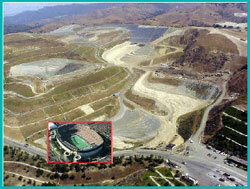 Landfills generate lots of methane. The majority of the stuff we throw away is food scraps, used paper and yard trimmings – things that rot. When that happens inside a lined landfill underground, the little air in the confined space is quickly used up, creating oxygen-starved, or “anaerobic,” conditions. When there is ample moisture, microbes that thrive without air break down those organic discards and, in the process, throw off gas, most of which is methane and CO2. 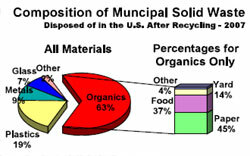 About half America’s discards is landfilled (see left), and almost two-thirds of that decomposes (on right). Over the 100 years or so that landfills generate gas, methane equivalent to as much as 472 million tons of carbon dioxide will be generated from just one year’s trash, which is a third more than from heating and cooling all of the homes in the country. So landfills make lots of methane. The $64,000 question is how much escapes into the atmosphere. Most landfill gas escapes. Landfilled trash is not, as many imagine, tidily buried deep underground where gases can easily be trapped. Rather, most garbage gets piled up into manmade mountains – bigger than 100 football stadiums – that sprawl over hundreds of acres and reach hundreds of feet high above grade. Obviously, there is no smokestack through which escaping gases pass to be caught and measured. Instead, gas is released, largely undetected, from above, below and especially out the sides – through anywhere a break in the liner creates a path of least resistance for gas to flow. Also, landfill gas continues being generated for decades, long after the wastes were first buried, and way past the time the site has been abandoned. Capturing all that gas would be extremely challenging, even if there were a strong will to do so. Unfortunately, because of politics, there was none. EPA responded by emphasizing voluntary programs, shutting its eyes to the fact they were found to have no impact on improving profit-motivated corporate behavior. At the same time as political pressures blunted regulatory initiatives, the time came for EPA to issue its air rules for landfills. The Agency ignored the strict requirements mandated in the 1990 Clean Air Act Amendments, which had earlier been applied to other industries. Instead of enforceable emission limits, landfill owners were allowed “to design their own collection systems [in order] to provide flexibility and encourage technological innovation.” And even that jawboning only applied to the largest landfills, while 95% of all landfills were exempted. EPA also inexplicably flouted the law’s requirement to impose the strictest standards on sources, such as landfills, that release cancer causing toxic emissions like benzene. Not surprisingly, the only substantive thing that the voluntary rule did achieve was to codify what the landfill industry had found it was financially compelled to do anyway. Since 1991, in order to protect groundwater, landfills have had to be lined and covered, typically with two feet of clay overlaid with a sheet of plastic the thickness of a credit card. At the largest of those sites – the only ones affected by the air rule – too much pressure from all that gas built up after they were tightly sealed. That pressure overwhelmed passive venting systems and literally blew out the expensive covers. To avoid repeatedly spending millions of dollars for replacements, their owners already had to install rudimentary gas collection to serve as a pressure relief valve – though only during the time the site was capped. Unfortunately, landfill owners had no economic incentive to care about what happened before the cover went on, or after it deteriorated decades later. For those were the times when there was lots more moisture that generated most of the gas over a landfill’s life. Thus, EPA’s rules generally don’t require any attempts to collect the gas for the first five years, even though a good deal of gas is generated before then. Worse, in order to boost profits, a growing number of sites ignore the requirement to keep the sites dry. These landfills accelerate decomposition while the site is still open by adding sewage sludge, recirculating leachate and delaying installation of the final cover to let in more rain. The voids created by enhanced decay recovers about a quarter of the space in the landfill to be re-sold a second time, but at a terrible cost since much of that souped-up gas generation is uncontrolled. Susan Thornloe (EPA/NRMRL), Innovative Air Monitoring at Landfills Using Optical Remote Sensing with Radial Plume Mapping (February 22, 2007), at 4. Then, 30 years after the site eventually closes, which is as long as the owner is required to maintain the site, the gas collection systems will have been turned off, and, without anymore care, the cover will inevitably deteriorate. As California and other state regulators concluded, that will revive a second wave of gas generation. Against all these obstacles, the landfill industry argues that, somehow, more than 95% of the gases are captured. They do this alchemy by focusing only on the best run sites during the short time when the gas systems are at their peak. There are two major errors in how landfills’ greenhouse gas emissions have historically been accounted for. Fix them and landfills are responsible for much more of manmade greenhouse gases than is conventionally thought – four times more, which makes landfills the fourth largest source of manmade greenhouse gases. There are two major errors in how landfills’ greenhouse gas emissions have historically been accounted for: first, in outdated calculations of methane’s global warming potential, and, second, overstated guesstimates of landfill gas collection efficiency. Fixing them has significant implications for correctly assessing landfills’ responsibility for greenhouse gases. 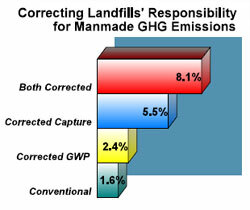 If the wrong numbers are used, as done in traditional GHG inventories, landfills only appear to be responsible for 1.6% of total manmade emissions. However, when these mistakes are fixed, landfills climate almost 5×, representing 8.1% of climate changing gases. Landfills are, it turns out, among the largest sources of climate changing emissions, and even more so in the next critical 20 years when methane’s warming potential is more than 100× CO2. LFGTE can reduce GHG emissions by avoiding the need to generate as much electricity at fossil-fueled utility plants, which release carbon dioxide when they burn coal or gas. That much is generally accepted. However, a wider view and deeper examination shows that the costs of LFGTE are greater emissions of methane, which has more than 33× CO2’s warming potential, and, therefore, always overwhelms those benefits measured in units of carbon dioxide. Essentially, landfill gas from well run sites managed to minimize releases has very little energy value because there is too little moisture. 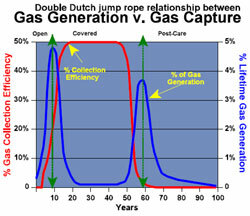 The very operational changes needed to pump up landfill gas’s Btu value upend best practices and much methane escapes. Because methane is such a high octane warming gas, and because some methane escapes, even in the landfill industry’s goldilocks tale of gas collection efficiency. Therefore, diverting the organic discards -- which in landfills, and only in landfills, generate significant volumes of methane -- is, EPA repeatedly held, always preferred. 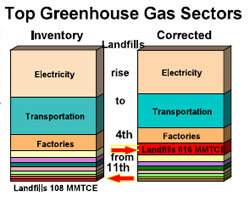 If landfills, which are bent to serve the goal of producing power in addition to minimizing releases, were otherwise operated the same as a typical dry tomb landfill, then there would be net benefits by avoiding the need to generate as much power, with its associated GHG emissions, on the utility grid. But that condition is not true. For one thing, the proportion of methane in landfill gas generated at traditional dry tomb sites would be too low to economically operate the reciprocating engines that typically generate electricity. For another, those same operational changes needed to enhance methane concentration to economic levels degrade gas collection efficiency. The Sierra Club conducted a two year investigation that documents these conclusions, which can be found online here. Landfills, where half of our discards go, are a failed technology, inherently incapable of capturing anymore than a small fraction of the enormous volume of methane they generate. Fortunately, more than 100 cities have acted to divert almost everything buried that would rot in order to prevent methane from being generated in the first instance. Those initiatives are directly the result of citizen activists pushing local officials to act. Think globally – act locally. Since there is no feasible means to capture most of the fugitive gas during the critical times when most is generated in today’s mega-sized landfills, it is imperative that organic discards be kept out of the ground – which is the only place garbage produces so much methane – in order to prevent the powerful greenhouse gas from being generated in the first instance. Food scraps, soiled paper and yard trimmings, along recyclable paper are more than 95% of the organic discards that now rot, and generate methane, in our landfills, and there are proven ways to recover all of them. That’s where you can make a real difference because an ounce of prevention is worth a pound of cure and because the place where things are happening turns out to be on the local level. 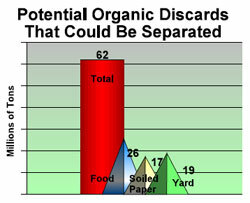 In 1999, Europe ordered that organics be phased out of landfills. Unfortunately, on this side of the Atlantic, the political power of the landfill industry in Washington is substantially more entrenched, and EPA has been AWOL. But, action is percolating on the local level here. 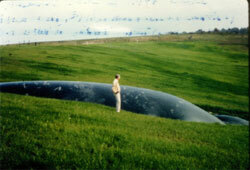 In the early 1990s’s 22 states enacted laws that banned the landfilling of yard trimmings. More recently, across the North America, more than 100 cities like San Francisco, Seattle and Portland are moving aggressively to also divert their residents’ food scraps from the landfill and to composters, in order to produce compost to help restore fertility to our badly depleted soils. You can read more about them and how they did it in this report. And here is an up-to-date list to Find-AComposter in you area.